I know, I know…you’ve barely have any of your holiday sewing finished and I’m suggesting a quilt challenge? Well, not me specifically. Now, I’ve heard from some of you that Tangerine Tango just doesn’t fit into your wardrobe..either you’re just not an “orange gal” or that it’s too bright for your classic wardrobe. So, why not take up the Tangerine Tango Quilt Challenge and make a cheery quilt? If you’re a tried and true Chicago Bears fan, you could use the orange as a memorial to the season we almost and could’ve…should have! had before Cutler’s thumb injury. Still not convinced of making a quilt because it’s too fussy? Still want to hold true to making garments? So, why not challenge yourself to add a bit of Tangerine Tango as a trim…perhaps, some piping…or be bold and use one of these tantalizing Tangerines to tango as a lining in a new spring coat. Here’s the simplest reason to try Tangerine Tango: Winter is finally creeping up on us today with a very cold chill in the air. Maybe a little Tangerine Tango will bringing warmer thoughts until the temperature starts rising again. 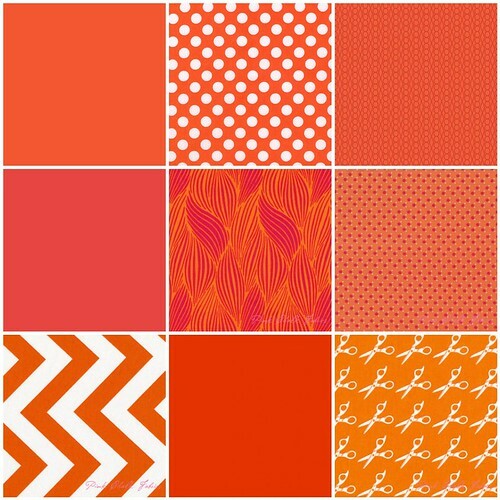 Follow the quilts that will be posted on the Tangerine Tango Quilt Challenge Flickr album; I’m sure that if nothing else, you’ll love seeing what others will be inspired to do with this beautiful, bright hue.